On Friday hubby and I celebrated our 32nd wedding anniversary. While you read this, you may want to ask us, how did you celebrate? Where did you go? What present did you get? etc etc. Truthfully we didn’t do anything special as such.I was too busy preparing for the Lions Club poetry recital competition. The first few years of our marriage, my hubby would always forget the anniversary date but my mother in law would remember and make it into a special day. As years went by, kids would remind my hubby that a special day is approaching. Presents, dinner etc was the norm.As we grow older presents and dinners are not that important. We spent Friday going through our wedding album. It took us back to sweet memories and how family and friends looked back then. Do we feel we have been married for 32 years? Not really, the memory of our wedding day is still fresh and vivid. In reality hubby and I are poles apart, opposites in most respect but over the years we have found a common ground, always have something to talk about, take an interest in each others passions, give each other space and most importantly trust each other. I can’t remember calling up my hubby every hour or keeping a tab on every hour spent outside home. Neither does he. That does not mean we don’t love each other or romance in our marriage is dead. Little actions and thoughts makes our marriage work. We try and make our anniversaries special in little ways. This anniversary he has promised to let me shop in India till I drop. How sweet, but he knows I am not a shopaholic. I buy want I need and that’s all. However, I can go overboard if I went to a kitchen ware store or a book shop! What did I do for him? 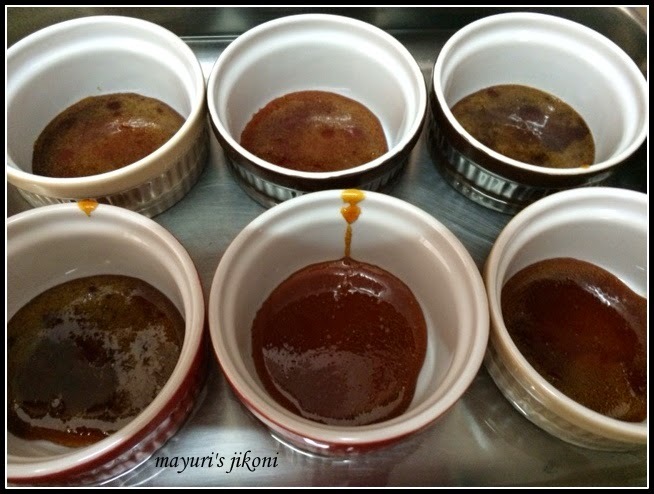 I made for him his all time favourite dessert… caramel custard. And boy! what a lovely present it turned out to be. Previous 3 attempts had failed and finally I got it right. The first time I tried a Betty Crocker recipe and it was a total failure in every respect. The tops were burnt, the temperature given was all wrong and the custard tasted like curdled eggs. The second time, the caramel was all wrong. 3rd was not too bad, but had a few big bubble holes in the custard. 4th attempt was a winner. Never mind the crack I got while removing it onto a plate. Probably shook it too much! Does your hubby remember your anniversary date? If he does, does he know how many years you both have been married for? Take a deep baking tray (like a roasting pan). Place 6 ramekin bowls in the pan. Put the sugar and water in a heavy bottom pan. Put the pan over medium heat. Stir the mixture till the sugar melts. Let the mixture cook, swirl the pan occasionally till you get a golden liquid. Remove the pan immediately from the heat. Divide the caramel between the 6 ramekin bowls. Swirl the bowls to spread out the syrup. Add saffron to the 2 tbsp hot milk. Heat the 2 cups of milk in a pan till its just warm and not hot. Add the sugar and vanilla extract. Add eggs into a bowl. Beat lightly to break up the yolks. Add the milk mixture to the eggs and beat lightly to mix everything. Pour the saffron mixture to the strained mixture and mix. Divide the mixture between 6 ramekin bowls. Pour hot water in the baking tray carefully till its half way up till the bowls. Carefully place the tray in the oven and bake for 25 -30 minutes. The tops will have set but the custard will be a bit wobbly. Insert a knife in the middle and it should come out clean. Remove the tray from the oven. Let the custard cool in the tray. Place the custard in the fridge to chill for 2-3 hours. To serve, carefully run a knife around the edge. Place a small dessert plate over it. Turn it over. Shake it a little and the caramel custard will come out. Some recipes make the milk hot some don’t. I decided to have it warm and it worked well for me. If the milk is too hot it will cook the eggs. Straining the liquid helps to remove foam and bubbles that may be formed during beating. I placed the tray on the lower shelf in the oven to prevent the custard from burning on top. I added saffron for that extra taste. Our friend’s mum takes 3/4 part milk and 1/4 part fresh cream to make the custard more creamier. Don’t let the sugar become too dark, otherwise it will taste bitter. Check the custard after 15 minutes of baking. If the top is beginning to brown then cover the ramekins with aluminium foil. oh wow, happy marriage anniversary to both of you, what a lovely yummy way to celebrate. Happy Anniversary, the caramel custard looks super delicious. This is my hubby's favourite.. not made it for a while. Happy anniversary. Custard looks inviting.